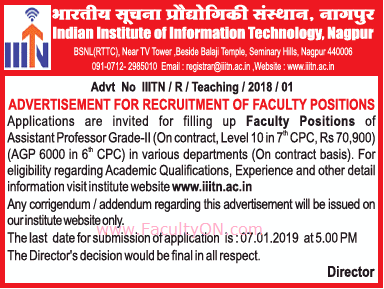 Indian Institute of Information Technology (IIIT), Nagpur has advertised for recruitment of Assistant Professor jobs vacancies. Interested and eligible job aspirants are requested to apply on or before 07th January 2019. Check out further more details below. About College : Indian Institute of Information Technology, Nagpur is one of the Indian Institutes of Information Technology and an Institute of National Importance located in Nagpur, Maharashtra. The institute started functioning from July 2016 in a temporary campus at Bharat Sanchar Nigam Limited's Regional Telecom Training Centre. As per AICTE norms. Candidates having Ph.D will be preferred. How to Apply: Interested and eligible candidates are required to send application prescribed format along with copies of certificates along with recent PP size photo the postal address mentioned below.